The results for both the Tamron and Sigma models are very similar, with the Sigma only very slightly better than the Tamron over the entire focal range. Of greater note is that both lenses are exceptionally good when compared to the Nikon 17-55mm and the Canon 17-55mm f/2.8, which are twice as expensive! Even with slightly better results for the Sigma, the Tamron lens remains a serious contender. At center, its resolution is good up to 35mm, and dips only a bit at 50mm, while still providing satisfactory results (50 lp.mm across the entire focal range). However, the Tamron’s resolution drops a bit quicker than for the Sigma 17-50mm. Tamron controls vignetting and chromatic aberrations very well— the latter particularly so, especially when compared to its competitors. 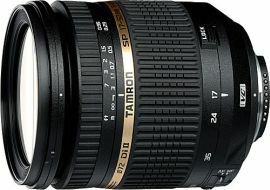 At 17mm, however, there is more distortion for the Tamron lens than for either the Nikon or Sigma models. Overall, the Tamron 17-50mm rates a score of 13 for image quality, which by itself would put it in a good position to compete in the wide-angle zoom category. However, in terms of other considerations, such as build quality, the Tamron feels a bit too plastic to compete on the high-end market where it’s supposed to be. The focus and zoom rings operate smoothly, but the focus path short length makes it somewhat difficult to use. The non-rotating front element, however, will work nicely with polarizers. In summary, if you are looking for a stabilized luminous lens kit at a lower cost, either the Tamron or the slightly-superior Sigma will work well — especially since both lenses deliver better image quality than the more expensive Canon or Nikon 17-55mm.